I wanted to re-read this work for quite some time now, and I am left with a feeling of melancholy and despair after doing so. Yet this second novel of the great great Chinua Achebe shows how far ahead of his time he was, allied to his incredible vision and perception. Mainly, nowadays we lament the horrific effects of corruption in our midst, but in this novel (published in 1960!) Achebe already delineates how corruption can insidiously creep upon even the finest of (young) idealists, become a way of life, and (start to) destroy both individual and society. Hence the tragedy of Obi Okonkwo here, who seemed to have everything on his side: youth, intelligence, education (British-trained), fine character, and an excellent “government job” to boot. He does not have a wife nor children, yet he descends into corruption as he can not cope with the pressures and demands of the society. Achebe brilliantly shows how this is possible; how and why it happened – and we can only but lament in the end. The role, the push and pull of Obi’s village, extended family, his “sparkling car”, tax, loan repayment (pursuant to his studying overseas) etc. It is quite heart-rending. A modern reader might ponder: if a fine, idealistic young man like Obi can succumb to corruption (even going as far as sleeping with females who want him to help them with scholarships et al) is there any hope for African society in general? As the decades have unfolded in virtually all our countries, we have been rocked with extraordinary revelations of corruption, and Nigeria of course has been amongst the worst. Yet the vast majority of the people are in abject poverty, with a very small fraction stupendously wealthy! Hence we can discern from this brilliant early novel (I probably like it even more than the author’s classic, Things fall apart) many of the deep-seated elements that spark corruption in our society; and with so many individuals incredibly greedy and unconscionable once “in power”, it is perhaps no surprise that Africa has been devastated and stripped in gruesome fashion over the years. This is a novel that should be read by all. 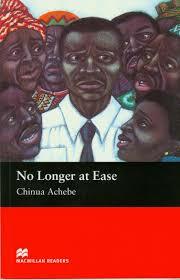 Great, great writer the late Pa Achebe. Put Africa on the map. Very thought provoking perspective(s) here.